Sound data on companies’ contribution to attaining the SDGs is critical for assessing the progress of SDGs implementation. This enhances SDG-oriented corporate governance mechanisms, well grounded investor decision making, and promoting behavioral change at the enterprise level. In this regard, addressing some key issues enhances the usefulness of corporate sustainability and ESG reporting by improving the quality, comparability and reliability of data reflecting companies’ responsiveness to targets and indicators agreed by United Nations member States. In response to this challenge UNCTAD is launching its initiative on selecting a limited number of core SDG indicators in companies reporting. It is my pleasure to invite ISAR members to participate in the discussions of this initiative at the ISAR’s High-Level Policy Dialogue during the UNCTAD 14 Conference in Nairobi on 21 July 2016 as well as at the 33d session ISAR, which will take place on 4-6 October 2016 in Geneva. The Fourteenth Quadrennial Ministerial conference of UNCTAD (UNCTAD14) will take place in Nairobi, Kenya, from 17 to 22 July 2016. UNCTAD 14 will bring together Heads of State and Government, ministers and other prominent players from the business world, civil society and academia to tackle global trade and economic development issues. The quadrennial Conference will also be a unique opportunity to consider the most appropriate means of delivering on the 2030 Agenda for Sustainable Development. The World Investment Forum 2016 will also take place in Nairobi in parallel with the UNCTAD14 conference. It will continue to serve as the global forum for inclusive dialogue and policy formulation on investment-development needs at the highest level, bringing together investment partners to discuss challenges, opportunities and policy solution to meet the SDGs. 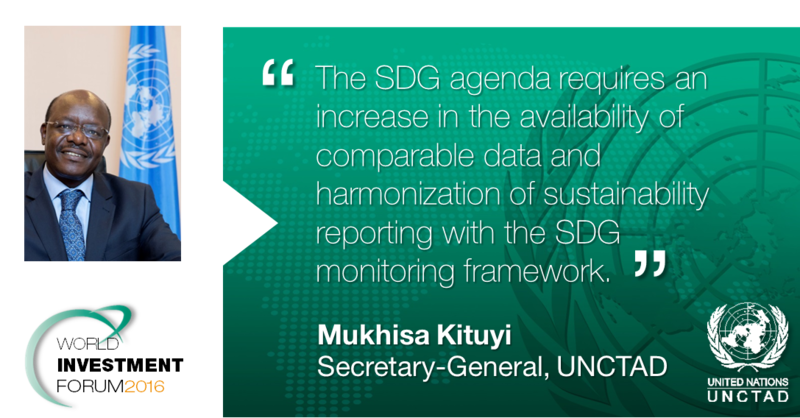 As part of UNCTAD 14 and the World Investment Forum, ISAR will be hosting the High-Level Policy Dialogue on Sustainability Reporting on 21 July 2016. The event will assess the private sector contribution to the SDGs, explore current trends in sustainability reporting frameworks and their harmonization, and support SDGs reporting as a means to align corporate reporting and the SDGs monitoring mechanism. The session will also include presentations by countries that implemented the Accounting Development Tool during the intersession period, and updates from other international and regional organizations in the area of corporate reporting.Additional information on speakers and registration for this event will be circulated soon to the ISAR network.Furthermore, a technical workshop on accounting and reporting will be held at the Palais des Nations in Geneva on Monday 3 October 2016. The 2014 and 2015 editions of the annual Review of International Accounting and Reporting Issues have been published. These volumes are focused on issues of monitoring of compliance and enforcement for high-quality reporting, including a review of good practices and case studies of Australia, Belgium, Canada, Germany and the United Kingdom. The European Commission held a public consultation on non-financial reporting guidelines between January and April 2016. The objective of the public consultation was to collect stakeholder views on methodology for non-financial reporting in the context of Directive 2014/95/EU. Over 300 responses were collected and a summary is forthcoming. On 10 May, the International Financial Reporting Standards (IFRS) Foundation published the 2016 edition of the Pocket Guide to IFRS Standards: the global financial reporting language. The report analyses the state of IFRS implementation in 143 jurisdictions. Highlights include: over 80% of jurisdictions now require IFRS for the reporting of most domestic publicly accountable entities; and 80 jurisdictions require ore permit the use of IFRS for SMEs. Further information on the press release can be accessed by clicking here and the full report is available on this link. The International Federation of Accountants (IFAC) published an article by ISAR network member Kurt Ramin on the reporting of corporate financial performance. The article outlines financial performance reporting as an ongoing research topic in accounting, drawing on guidelines used by IASB and FASB. The article also mentions Kurt Ramin’s presentation on a new model for performance reporting at ISAR 32. The International Forum of Independent Audit Regulators (IFIAR) and the six largest accounting and audit network firms have agreed on an initiative to improve the global quality of audit, with a view to reducing the number of deficient audits. A measurable target was set to reduce deficient audits by at least 25% in the next four years, vis-à-vis the figures uncovered as part of IFIAR’s Report on 2015 Inspection Findings Survey. Further details on the Survey and IFIAR’s strategy to improve audit quality can be found here. In April 2016, the International Organisation of Supreme Audit Institutions (INTOSAI) Secretary General Josef Moser met with UN Under-Secretary-General Wu Hongbo, ECOSOC President Oh Joon and United Nations Secretary General Chef de Cabinet Edmont Mulet during the fifteenth Session of the UN Committee of Experts on Public Administration. INTOSAI and the UN will co-organize a side event on the role of Supreme Audit Institutions in implementing the SDGs, to be held in July 2016. The International Organization of Securities Commissions (IOSCO) published its Survey Report on Audit Committee Oversight of Auditors, which tracks current practices and possible improvement points for audit committees. Among others, the survey indicates that over 95% of responding jurisdictions required publicly listed companies to establish an audit committee or other similar governance body. IOSCO also underlined the importance of audit committee independence, experience and communications. GRI: New research shows a surge in reporting policies. What does it mean for business and the future of reporting? The 4th edition of the Carrots & Sticks report, published by the Global Reporting Initiative (GRI), the United Nations Environment Programme (UNEP), KMPG International and the Centre for Corporate Governance in Africa in May 2016, painted a thorough picture of international practices in sustainability disclosures. One of the report’s highlights is the finding that 64 countries have sustainability reporting policies in place, with a total of almost 400 policies globally. Of the reporting instruments, 65% were mandatory. “The surge in reporting policies shows increased commitments and efforts to achieve transparency and accountability, but at the same time, the large number and variety of instruments can pose challenges for reporting organizations. Alignment and policy harmonization must be a key goal for governments, market regulators, stock exchanges, industry associations, standard setters and all those responsible for developing reporting instruments.” Further information is available here. CDSB: Is sustainability lost in the right direction? A new report from the Climate Disclosure Standards Board (CDSB) and the Association of Chartered Certified Accountants (ACCA), Mapping the sustainability reporting landscape – Lost in the right direction, highlights the fragmentation of the sustainability reporting landscape. It also suggests that corporate reporting is given a new role in the context of the SDGs, with CDSB’s director Lois Guthrie stating that “The last decade or so has seen the rise of a new order of corporate reporting, which is radically different from the practices of the past.” Click here for the press release and here for the full report.